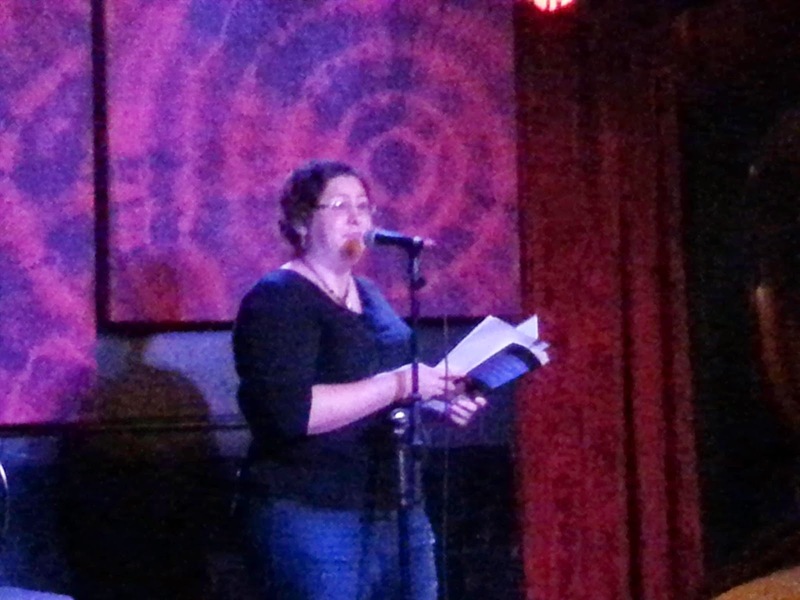 Lauren Scharhag: "Bravo, Blue Monday Poets!" In the audience that evening was Rane Bo Cross, the force behind Paraplui Productions and the Fishnets Experiment. She did a write-up of the event. “The night really began and ended with the featured poet of the night. Our shaggy-haired host, Mr. Hughes, takes over the mic to proudly introduce Lauren Scharhag, and purr-growls his promise to us that we won’t be disappointed, then hands the stage off to this unassuming woman who looks so pleasant and gentle. She briefly introduces herself and informs us of a last minute rearrangement in her poetry playlist, then proceeds to upend her 'Garbage Pail Kids' right onto the invisible table in front of us – lifting the bucket up and away so that we can see the spread up close and personal, can inspect it with our own noses. She has me pumping my fist in silent cheers one second, then the next she gives me a good, hard elbow in the ribs to remind just how good I really had it as a child. “After the applause ends, she apologizes and warns us that she is about to take us to the dark side, where it gets deep and heavy, but she promises to reward us with something lighter and happier at the end. I settle in for a creepy female Poe/slightly crazy Plath something or other, but what she dishes in my lap is a torturous heart squeezing list . . . The List of Things Learned while caring for a spouse-lover-friend-partner who is terminally ill. Her list stabbed me in my scarred over wounds, dug up and into my worst fears, and let me weep for one minute after another after another in her brutally honest, yet gently forceful way. I was unable to write more than a two word scrawl for later in my notepad, didn’t care about taking notes. I was with her all the way down the roller coaster. “After wringing my tear ducts into silent submission, she makes good on her word and delivers a much needed, albeit 'Awkward Hug' and the laughter bubbling up through her reading of the poem is the real reward at the end. She truly was more hilarious and entertaining than the handful of comedians I saw doing stand-up at the next event on the same stage once the poetry time was up, and I swear her manner and method and strength of delivery has to have doubled the power of her words. And I realize that this is exactly why poetry reading nights exist, so the Laurens of the world have a place to make their real art come to life. I don’t even know what to say, Rane. Thank you so, so much. As a fellow artist, I’m sure you understand how important it is to receive this kind of feedback and encouragement. Anytime I have doubts about what I’m doing, I’ll be able to come back to this and find the motivation to go on. To see the rest of the Blue Monday photos and Rane’s commentary, check out her Fishnet Experiments page on Facebook. 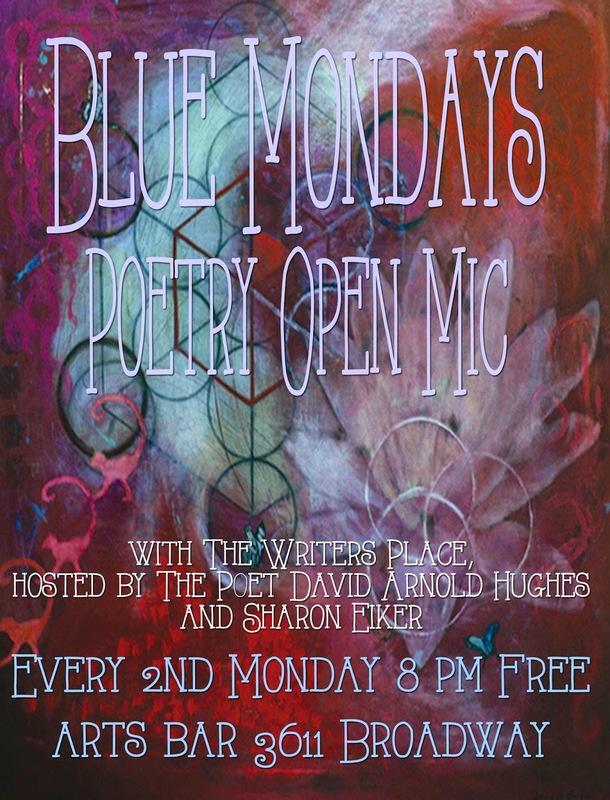 Be sure to come to the next Blue Monday, every second Monday at the Uptown Arts Bar in Kansas City, MO!